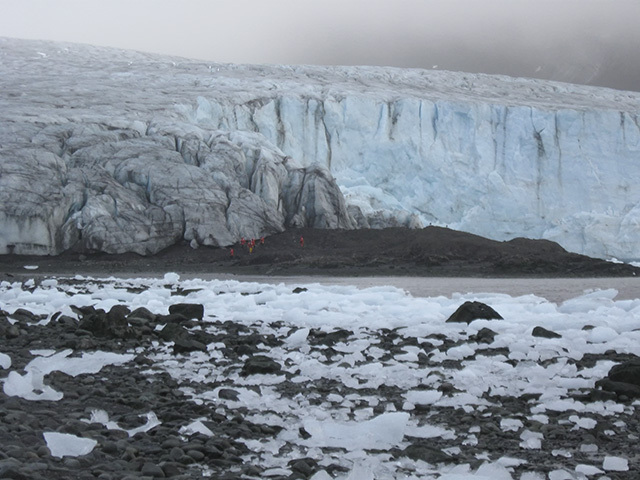 Members of the research team approach Ecology Glacier on Livingston Island. Photo: Jon Moore. On the surface, Antarctica’s remote, northernmost islands appear barren and devoid of life. But it is their isolation that has allowed the Scotia Arc to exist as a sanctuary for huge numbers of species living under the sea. For millions of years the cold waters surrounding the Antarctic have kept the ecosystem largely predator-free, allowing fish like the Chilean sea bass and other notothenioids to thrive. But as global temperatures get warmer, pathways open up for invasive species like king crab to come in and disrupt the Southern Ocean’s fragile food web. In this Teen Science Cafe, Alex Dornburg, the Museum’s Research Curator of Ichthyology, will share stories from his research in Antarctica’s cradle of biodiversity. Alex Dornburg is the Research Curator of Ichthyology at the North Carolina Museum of Natural Sciences. Alex’s research takes an integrative approach to explore the factors that underlie the origin and maintenance of biodiversity in ray-finned fishes (Actinopterygii). Actinopterygiians comprise over half of all living vertebrate species. For Dornburg, having better understanding of their history will shed light on some longstanding questions in evolutionary biology.